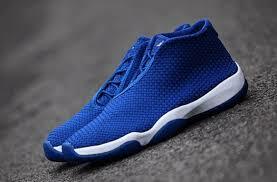 A release date for the Jordan Future Varsity Royal Blue has been set for May 24th. This will mean we will get two Jordan Future launches in May. The first release this month will be the Dark Army/Black Sail “Camo” Future that drops on 5/17. The Varsity Royal/White colorway will release the next week on 5/24. Stay tuned to our early links section for your best chance to cop these kicks.